An item lying on the floor. Definition at line 43 of file flooritem.h. Definition at line 49 of file flooritem.cpp. Definition at line 113 of file flooritem.h. Draws the Actor to the given graphics context. Note: this function could be simplified if the graphics context would support setting a translation offset. It already does this partly with the clipping rectangle support. Definition at line 158 of file flooritem.cpp. References BLOCK_END, BLOCK_START, CAST_S32, cur_time, CompoundSprite::drawSimple(), Font::drawString(), Graphics::fillRectangle(), UserColorId::FLOOR_ITEM_TEXT, ServerCommandType::font, ActorSprite::getActorX(), ActorSprite::getActorY(), UserPalette::getColor(), Gui::getFont(), Map::getTileHeight(), Map::getTileWidth(), gui, mAmount, mapTileSize, mDropTime, mHeightPosDiff, mHighlight, Actor::mMap, mX, mY, Graphics::setColor(), Catch::toString(), userPalette, x, and y. Definition at line 221 of file flooritem.cpp. Referenced by getHoverCursor(), PopupMenu::handleLink(), and PopupMenu::showPopup(). Definition at line 104 of file flooritem.h. Definition at line 132 of file flooritem.h. Definition at line 116 of file flooritem.h. References getCard(), mCursor, and setCards(). Definition at line 129 of file flooritem.h. Returns the item info for this floor item. Useful for adding an item link for the floor item to chat. Definition at line 140 of file flooritem.cpp. Definition at line 81 of file flooritem.h. References A_WARN_UNUSED, getInfo(), getName(), and mItemId. Referenced by Actions::changeRelation(), PopupMenu::handleLink(), ItemSoundManager::playSfx(), and PopupMenu::showPopup(). Definition at line 126 of file flooritem.h. Definition at line 145 of file flooritem.cpp. References ItemDB::get(), ItemInfo::getName(), Net::getNetworkType(), Actions::info(), mColor, mItemId, and ServerType::TMWATHENA. Referenced by ActorManager::checkForPickup(), getItemId(), ActorManager::pickUpAll(), ActorManager::pickUpNearest(), and PopupMenu::showPopup(). Definition at line 101 of file flooritem.h. Definition at line 123 of file flooritem.h. Definition at line 107 of file flooritem.h. Returns the x coordinate in tiles of the actor. Definition at line 92 of file flooritem.h. Referenced by LocalPlayer::pickUp(), and ActorManager::pickUpNearest(). Returns the y coordinate in tiles of the actor. Definition at line 95 of file flooritem.h. Returns the type of the ActorSprite. Definition at line 71 of file flooritem.h. 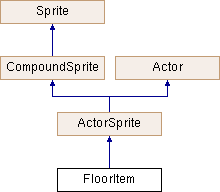 References A_NONNULL, draw(), and ActorType::FloorItem. Definition at line 98 of file flooritem.h. Definition at line 80 of file flooritem.cpp. References DisplayType::Floor, ForceDisplay_true, ItemDB::get(), ItemInfo::getDisplay(), ItemInfo::getDyeIconColorsString(), Map::getHeightOffset(), ItemInfo::getMaxFloorOffsetX(), ItemInfo::getMaxFloorOffsetY(), ItemInfo::getPickupCursor(), Map::getTileHeight(), Map::getTileWidth(), Net::ServerFeatures::haveExtendedDropsPosition(), Actions::info(), mapTileSize, mColor, mCursor, mHeightPosDiff, mItemId, Actor::mPixelX, Actor::mPixelY, Actor::mPos, mX, mY, Actor::mYDiff, serverFeatures, ActorSprite::setMap(), ActorSprite::setupSpriteDisplay(), Vector::x, and Vector::y. Definition at line 129 of file flooritem.cpp. Referenced by FloorItem(), and getHoverCursor(). Definition at line 110 of file flooritem.h. Definition at line 140 of file flooritem.h. Definition at line 136 of file flooritem.h. Referenced by getCard(), and setCards(). Definition at line 146 of file flooritem.h. Referenced by getColor(), getName(), and postInit(). Definition at line 145 of file flooritem.h. Referenced by getHoverCursor(), and postInit(). Definition at line 148 of file flooritem.h. Definition at line 139 of file flooritem.h. Definition at line 142 of file flooritem.h. Referenced by draw(), and postInit(). Definition at line 150 of file flooritem.h. Referenced by disableHightlight(), and draw(). Definition at line 147 of file flooritem.h. Definition at line 137 of file flooritem.h. Referenced by getInfo(), getItemId(), getName(), and postInit(). Definition at line 143 of file flooritem.h. Definition at line 144 of file flooritem.h. Referenced by getPickupCount(), and incrementPickup(). Definition at line 141 of file flooritem.h. Definition at line 149 of file flooritem.h. Referenced by getShowMsg(), and setShowMsg(). Definition at line 138 of file flooritem.h. Referenced by draw(), getTileX(), and postInit(). Referenced by draw(), getTileY(), and postInit().